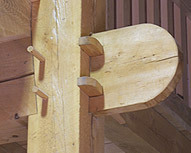 The most basic joint in timber framing is the Mortise & Tenon joint, illustrated here in the Girt (beam) to Post connection. Many other joints are simply variations on this joint. We house all of our mortise & tenon joints so that the beam and its loads are not resting solely on the tenon. This makes for a stronger and more appealing connection. 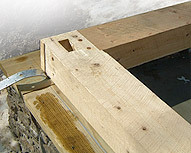 The Knee Brace is a critical element of the timber frame. Providing rigidity to the frame through triangulation, these diagonal members are used wherever major beams meet posts. Our authentically mortised knee brace joints are much stronger than half-lapped or nailed varieties. The foundations of early barns were often no more than large stones laid in minimally excavated trenches. These foundations would often move as seasonal freeze-thaw cycles took their toll. Large Timber Sills placed over these stones served to tie together the barn's Posts and keep the entire structure intact despite seasonal movements. For barns built today, we recommend using a modern concrete foundation (with footings below the frost line) but we still employ heavy Timber Sills under all of our barns for added strength, longevity and authenticity. We utilize a Mortise & Tenon joint at the corners to lock the sill timbers at right angles and a Mortise to receive a Tenon from the Corner Posts. As per modern building codes we also install pressure-treated 2x sills under the timbers. 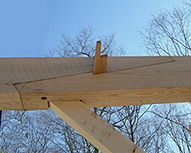 As longer timbers became scarcer, early Americans developed various Scarf Joints to join two shorter timbers end to end to make one longer beam. All of our larger barns (30' or longer) utilize the Stopped-Splayed Wedged Scarf to create continuous Top Plates and Purlin Plates. This interesting joint is a significant improvement on a simple half lap and is well designed to resist tensile, compressive and shear forces in the beam. 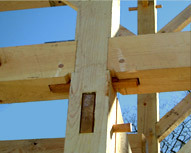 When two Girts (beams) are joined to a Post opposing each other at the same height, there is often not enough cross sectional width in the Post to allow for each Girt to have a Tenon of sufficient length. The solution is to employ a Spline Joint to make the connection solid and capable of resisting tensile forces within the beams. An oak Spline passes through a Through Mortise in the Post and is pegged through an Open Mortise in each Girt. Very Cool. This simple and sturdy joint was a very common way of joining together modest sized timber rafters eliminating the need for a Ridge Pole. The shoulder of each Half-Lap is parallel to the roof angle of the mating rafter and thus the layout of the joint is dictated by the building's roof pitch. Larger timber rafters such as Principle Rafters are usually large enough in cross section to allow for the use of a Mortise & Tenon at their peak. When no Ridge Pole is used, this is the strongest way to lock these timbers together at the ridge. 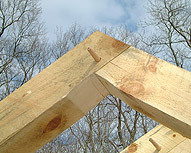 The joint's shoulder and tenon angles are dictated by the building's roof pitch. The Dutch Anchorbeam Barn's large roof loads exert a powerful outward thrust on the Purlin Posts and massive Anchorbeam. This force is well resisted by the Wedged Anchorbeam Joint, which features a Through Mortise and extended Tenon. The wedges draw the joint tight and are stronger than if the joint were only pegged. The end of the Tenon was often rounded to add embellishment. Barns of larger width (over 24') often need structural Posts to pick up mid-span roof loads. In some of our barn designs, these members originate at the loft floor level and they are called Queenposts while in other designs we use continuous Purlin Posts running from the Rafters down to the foundation. In either case, the thrust of the roof load wants to pull these Posts outward and we must find ways to resist those forces. One effective method is to install a Queengirt - a beam that ties a pair of Queenposts or Purlin Posts together and keeps them from spreading apart. The Queengirt's long Tenon is pegged at a Through Mortise. 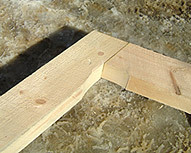 The extended Tenon length provides extra wood beyond the peg (called Relish) which resists the tensile forces within the beam. 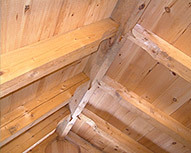 The earliest barns had no Ridge Pole and the rafters were simply joined as pairs at the ridge (see Half-Lapped Rafter Peak). The optional 5-Sided Ridge Pole adds strength and interest to the roof structure framing. We include this detail as a standard element in our New England Kingpost Barn.